You are the woman of the hour.Getting so popular Laura. More power to you !!! Love it! 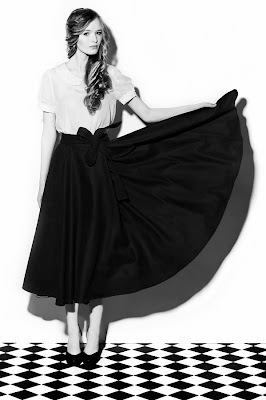 That's a great pic of you in the feature, the skirt is swoonie. What a lovely feature - congratulations! Wow, you're amazing! :) I love reading your posts! I'm Polish, and yes! Poca Poca is seriously amazing. They look like a great brand! The photos look nice and I like some of the pieces. Can't wait to see pictures! Congratulations on the piece! That´s amazing! And yes, I can see you in Poca & Poca clothing :) My favourite would be the last 2 ...so pretty! I really love the bow shouldered jumpsuit, gorgeous!! Ugh- gorgeous! Thank you Laura, this post came at just the right time. I've been sullenly glaring at the clothes in my closet and this is the perfect mental refresh/inspiration I needed. Gosh, capsule wardrobe- uh, dream come true??! Congratulations on being featured Laura! :) the designs by Poca & Poca are fantastic and so right up my alley! wow! congrats laura,very nice pics:) let's follow each other! Congrats on the feature Laura! :) Their designs looks classic and very chic. Laura!!! You're so lovely. I love your style, it certainly is timeless! I got a major virus warning when I tried to click on the link to the website. Gutting! I love the little interview you did, congrats! OBSESSED with this post. Love the black.